It is intended to inculcate the scientific aptitude and temperament, to fire the imagination and creativity, foster the spirit of enquiry and exploration among the masses, especially in the young minds, the officials said. The country's first gallery on robotic dinosaurs was today opened to the public. 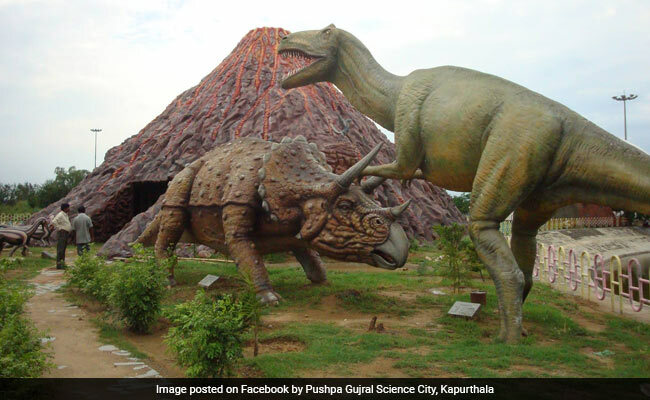 The country's first gallery on robotic dinosaurs was today opened to the public at the Pushpa Gujral Science City, the officials said. A joint initiative of the Union and state governments, the science city is the biggest project of its kind in northern India and has been set up in 72 acres of land in the heart of Punjab, on Jalandhar-Kapurthala road. A total of seven moving dinosaurs, made from robust steel and silica gel with durable motors, have been added to the already existing 46 exhibits of the extinct species, Deputy Commissioner of Kapurthala Mohd Tayyab said here after inaugurating the gallery. Mr Tayyab, who is also the Director General of the science city, disclosed that the new gallery will display the story of birth and evolution of dinosaurs in a unique manner and will be the main attraction for the visitors especially students. Built at a cost of Rs 1.50 crore, the gallery with its robotic dinosaurs as well as manually operated ones will take the visitors million of years back to the period when dinosaurs roamed the earth freely, adding to the overall entertainment quotient, said Mr Tayyab. The showcase of technology will enhance the knowledge of the visitors, he added.